According to our Frequency Matters report, only 24 percent of email lists consist of highly engaged subscribers, but they account for 83 percent of total reads. However, for best-in-class senders, this proportion is much higher, attributing to their superior program performance. Most marketers use engagement-level data to improve audience segmentation. For some, this is an evolution of outdated spam filtering practices and has now become standard, even if it is a roadblock to reaching business goals. While traditional factors such as infrastructure, authentication, and certification benefits still play a critical role in achieving inbox placement, audience engagement plays an important role too. Using data from Return Path’s Consumer Network, we carried out a detailed analysis that establishes a clear correlation between engagement and inbox placement. Primary: Actively engaged with their inbox over the last 30 days. Secondary: Less engaged than primary accounts. They receive a high number of promotional and transactional messages, but few personal messages. Dead: This group shows very little engagement with their inbox over the last 30 days. Over 75 percent of emails sent by best-in-class brands go to primary accounts and achieve average inbox placement rates of over 90 percent. Brands with average inbox placement rates lower than 10 percent are only sending 33 percent of their emails to primary accounts. The worst performing programs send most of their emails to secondary accounts (49 percent) and dead accounts (18 percent). For most mailbox providers, the message is clear—only the best senders will reach the inbox. The following illustration shows the composition of the target audience as a function of inbox placement. By profiling 125 brands’ target audiences and their inbox placement rates, we identify a clear correlation. 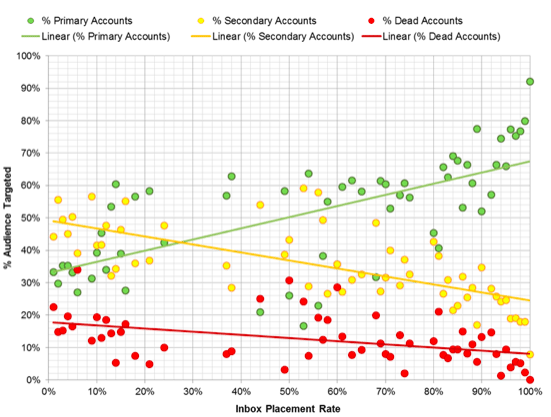 This graph profiles senders by the percentage of primary, secondary, and dead accounts in their lists, as well as their average inbox placement rates. 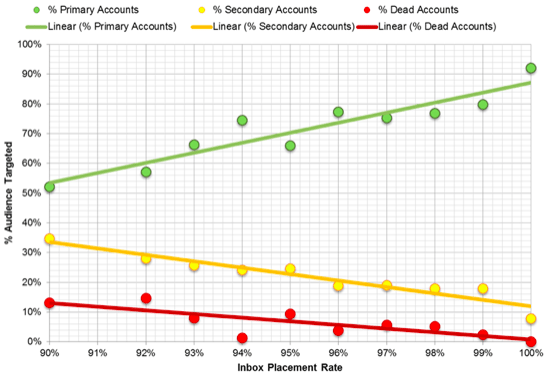 The linear trend lines show that inbox placement increases as the percentage of primary accounts targeted increases. Best-in-class brand subscriber lists contain over 75 percent primary accounts and average more than 90 percent inbox placement. Top-performers (82 percent primary, 16 percent secondary, 2 percent dead) are averaging over 99 percent inbox placement. Conversely, the more secondary and dead accounts targeted, the lower the inbox placement. Brands with lists containing 49 percent secondary and 18 percent dead email addresses, only average between zero to 10 percent inbox placement. This correlation highlights an important relationship between a sender’s list growth strategy and the resulting levels of engagement their program is likely to experience. Increase the number of primary accounts by monitoring each subscriber data collection point. Comparing KPIs such as open rate, click rate, complaint rate, and evasion rate as a function of how the addresses were sourced should be useful for your decision making. Build trust during the subscription process. Some brands are more trusted than others, meaning subscribers are more likely to provide their primary account during sign up. Building trust includes making a strong “no third-party share” statement, being specific about how personal data will be processed, and providing preferences so subscribers can tailor content and frequency. Maintain good list hygiene by excluding inactive subscribers after a reasonable period of time. Adapt send frequency and content for less engaged subscribers. Allow users to change their email address using a preference center. Applying list quality best practices is a good first step for building the foundation for improved engagement. Check out Return Path’s blog for tips and tricks for improving list quality. Also, consider Real-Time Email Validation as a solution for decreasing the amount of secondary and dead accounts on your list. Marketers should also re-evaluate the growth methods of their lists. Not surprisingly, acquiring new addresses “on the cheap” can lead to an increase in secondary addresses and dead addresses. This research reinforces, more than ever, the importance of subscriber engagement with brands, and their email program. Return Path clients can even apply these insights into their own email program. By using product features like Frequency Finder, they can see the breakdown of their own list into primary, secondary, and dead accounts. Return Path analyzed 125 sending domains to identify their overall inbox placement and percentage of primary, secondary, and dead accounts in their email lists. Depending on their average inbox placement rate, we grouped the various sending domains by the percentage of account types they were sending to. 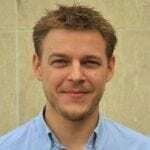 The data set used is from Return Path’s consumer network panel, which monitors the behavioral data of more than 2 million actual webmail subscribers.